Her powerful voice, seared with emotion, would become the daunting standard for other singers to match, but fans described a legacy beyond her most famous recordings. "Aretha made a lot of women look at themselves differently and changed how a lot of men looked at women," Alma Riley, 67, said after waiting in line outside the visitation at the Charles H. Wright Museum of African American History for nearly three hours. "That is particularly important today when we see such a lack of respect." "She was a symbol for us," Ann Fortson, 63, said after emerging from the rotunda. The retired teacher had driven seven hours from Charleston, West Virginia, with two friends the previous day. "There was no way we'd miss paying our respects." The preacher's daughter first topped the charts in 1967 with "Respect," her no-nonsense reworking of a modest hit for Otis Redding into an enduring anthem for feminism and the civil rights movement. Chaka Khan, Jennifer Hudson, Ronald Isley and Stevie Wonder, among others, are due to sing at her funeral on Friday at Detroit's Greater Grace Temple. Former US president Bill Clinton, who had Franklin sing at his 1993 inauguration celebrations, will be among the speakers. 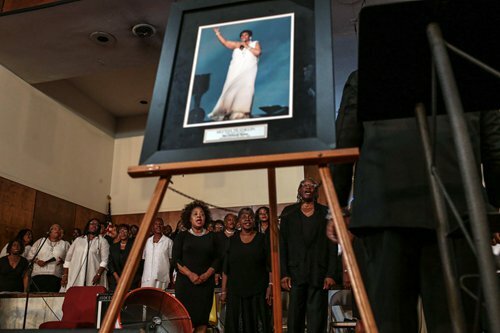 For some of those coping with grief at Tuesday's visitation, Franklin's songs, booming out of loudspeakers, were the cure: "Rock steady, baby," sang the familiar voice. "Just move your hips with a feeling from side to side." Some in the crowd could not help themselves but do just that.